The Mavs honored 4 players before the final home game of their careers–Karol Gruszecki, Kevin Butler, Cameron Catlett and Jordan Reves. The crowd gave them all a nice round of applause, and that was only the beginning of what was to be an incredible night for UTA. Perhaps inspired by the leadership of the four seniors on their special night, or maybe the rowdy crowd of 4800 at College Park Center, or just the fact that this team is just very, very, very good and wins a ton of games with an incredible defense…once again the Mavs played solid basketball for 40:00 and as a result soundly defeated a 19-win opponent. Utah State is a talented team with some big post players that shoots the ball pretty well (4th in WAC in FG, 45% and 3rd in 3pt FG at 35%) but also has been playing with a shorthanded bench due to injuries to several key players (eight players were in uniform tonight for USU, seven appear in tonight’s box score). At 19 wins, one can only imagine how good the Aggies might be with a deeper roster. The Mavs lead 28 -22 at halftime, limiting their own turnovers to 3 in the first half. The threes were falling for UTA tonight (11-24, 45%–lead by Butler making 5 of 10, Gruszecki 3 of 5) They held USU to 29%FG and 20% 3PT(2 of 10) in the first half. UTA went about 3:00 between scores early in the second half and USU would get as close as 5…but thanks to a couple of threes, some missed Aggie shots and a couple of Aggie turnovers, UT A turned a 5-point lead into a comfortable 16-point margin over the span of less than two minutes. The Mav defense got USU a bit rattled and even routine passes became an adventure at times. It was reminiscent of UTA’s defense against OU or last year’s UNT game. The crowd was into it, and the Mavs would let USU get no closer than 12 points the rest of the way. 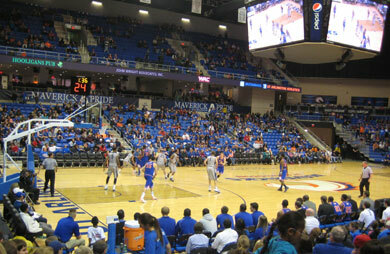 Overall, this was a big win for UTA against a very good team in front of a big home crowd. We’re now 17-10, worst case record is 17-12, best case is 19-10 going into the tournament. UTA has won 9 of their last 11 games, the offense seems to be running smoothly and the league-leading defense held their seventh opponent to 50 points or less. The next two games could be very interesting. Up next: two more 19-win teams: at Denver (19-8, 14-2) thursday, New Mexico State (19-10, 12-4) saturday to close out the regular season. This entry was posted in Basketball, College Park Center, Mavericks, Uncategorized, UT Arlington, UTA, Utah State, WAC, Win and tagged Big crowd, College Park Center, defense, mavericks, WAC, win by rustyhancock. Bookmark the permalink.